I have a lovely lamp-work large hole mandala pendant made by Laurie Ament of Isinglass Design; it was the first thing I thought about when I heard about this blog hop. I received it as a gift after it was donated by Laurie to a fundraiser for Hurricane Sandy organized by UWSLoves. 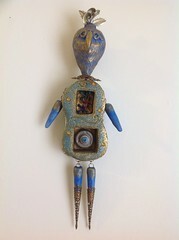 You can find Laurie’s work at Etsy, Facebook, and on her blog. I’m also a fan of Sheri Chase Jones of Sheribeads. Take the time to look through her sold sections–she can duplicate her glass designs and is great with custom orders. In trying to match Laurie’s pendant, I thought Sheri’s Evil Queen and Jazzy Jewels spacers were just what I wanted. I then went on vacation and my carpal tunnel has been acting up and I still hadn’t figured out what I was doing with said beads, when I got an idea. Those few of you who actually read my blog will know I promised to share some new things I am learning and also my mistakes with you, so it seems fortuitous that I now get an opportunity to share with you. The idea came from my spending hours untangling chains that were knotted together and repairing the necklaces. (Yes, I get paid for this.) I wanted to knot some chain on purpose. I’m not entirely happy with it, to be honest. Because I didn’t knot where the chain attached to the pendant, it moves, which makes the spacer beads end up being uneven on either side, so I constantly have to move it back into place. The beads are so incredible, I’m not convinced this is the best design to show them off. I like it…I just don’t love it. What do you think? I had grand plans to make more but with the carpel tunnel, by tendency to hoard in the first place, and my mind frame (it’s hard to be creative when you’re not happy with what you’re making), I have had to “give up the ghost” for this week. Any feedback is appreciated so I can have another go at it with fresh eyes. This entry was posted in Blog Hops, Challenges, design ideas and tagged Bead Hoarders Blog Hop, Isinglass Designs, Lori Anderson, Sheribeads, UWSLoves. Bookmark the permalink. 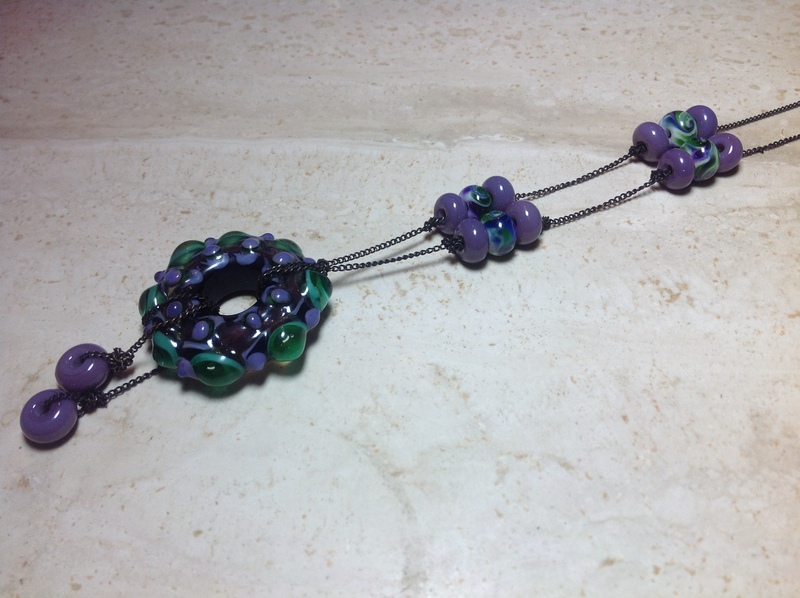 It looks great to me – the beads are beautiful, and I love the knotted chain idea! Thank you. I guess because I like polished and rustic styles, sometimes I feel like I accomplish neither. When I grow up, I’d like to be able to blend them better rather than doing one or the other. I like it a lot, but I know I would be annoyed if it wasn’t working out the way I envisaged. You may find that you come up with a solution after thinking about it for a while longer. Hope the wrists improve again soon. I had carpal tunnel when pregnant, it sucked, so I feel your pain. You should walk away and come back later for a second look because it is really a great necklace. I love the combinations of beads and the knotted chain idea is fab!Great job and hope your carpal tunnel settles down soon. These beads are gorgeous I can see why you have been keeping them! 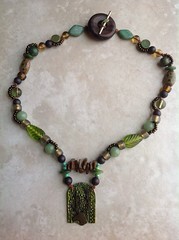 I love the way you have positioned the beads for this necklace in general. My only possible suggestion would be to consider a light but larger link chain or beaded chain in more subdued matching colors. Do you mean you don’t like the black brass? by beaded chain, do you mean beads on a chain without the knots or like stringing? Very pretty colors–I like it! These are such lovely beads, Lennis… perhaps you need to set the design aside if you are not satisfied with it? I hope your CT improves soon. I used to have such trouble with that when humidity was elevated. i love what you came up with! That mandala pendant is a looker, and for me, I love slider necklaces. I would leave it just as it is. If the beads don’t line up perfectly, that’s ok, that’s what asymmetrical is all about! Well you made me laugh! Well, Miss Lennis, I do believe it is quite lovely. Thank you for sharing your necklace, I love the colors and well as the design. The colours in your necklace are amazing. I like the design but if you decide to change it up, perhaps try off-setting the beads on each side of the chain, so they aren’t directly parallel with each other? 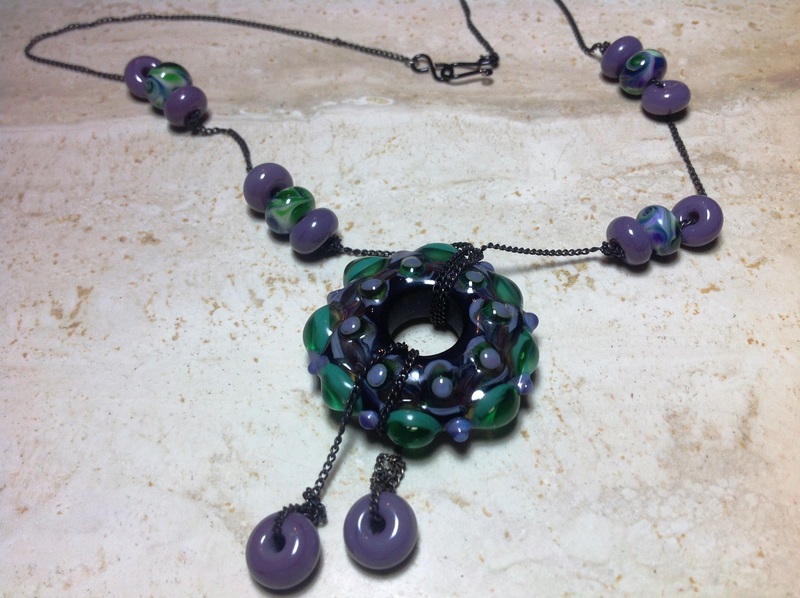 When the focal bead moves around, it won’t affect the overall design. Love the colors of the beads and I think the design is great. A Tolkien reference in the first sentence, what a beautiful thing to see. I like it the way it is, but I know when I make something that doesn’t turn out the way I wanted it really bothers me. I agree with the others who say to walk away for a little bit, then when you come back to it you’ll probably have a better idea of what you want to do. I think it looks great! I always roadtest pieces to see how they feel. That would totally drive me nuts if the other sections were falling out of symmetry when planned to be symmetric. I still think it looks very pretty and the knots are a great idea. Perhaps a little heavier chain? Sometimes you just have to embrace imperfection and pretend like you meant to do that 🙂 I’d wear it in a heartbeat and so what if the pendant is a bit to one side or the other! Life’s too short to sweat the small stuff. I like this, but I do agree, it drives me nuts when centerpieces moves and necklaces end up uneven… Maybe just tie a knot to keep it in place ? I don’t think I would have many ideas with a bead that has that big of a hole so I think you did a really nice job with it. However, in my experience, if YOU’RE not happy with your own design. . .it means you probably have a better one lurking within you. Here’s hoping your CT stops acting up and you get to feeling better soon! Lennis I like your design. It really showcases the lovely beads. If you knotted the chain above the pendant it would stay in place. I know…I didn’t think about it until I completed the other side…I will have to deconstruct. It’s a beautiful piece, but if it doesn’t sit the way you like you won’t wear it. The design lovely though. 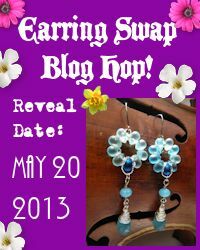 Stopped by to see your reveal for Lisa’s blog hop. Please message me when you post so I can see it! I participated in Lisa’s Elements Blog Hop. I have not participated in any other. 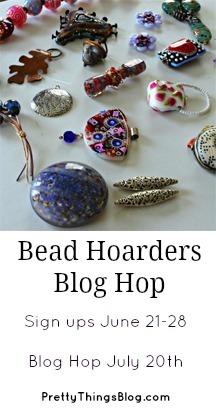 I think there was a typo on her list for the Colors Blog Hop because I did not pay for or receive beads. I do like what you made though! I love your design but completely understand what you were going through with design frustration, medical issues and such. Hopefully your ct is doing better and if you decide to re-work your design hope you post pics but I do love how this turned out. I actually just took off the hanging part and am wearing it! What a creative use of chain. I wouldn’t have thought of that. We are all our own worst critic, but I have to tell you I like your design. If you rework it to make it more what you envisioned, I wish you luck. If you keep it mainly as is, perhaps you’ll grow to enjoy it more. Best wishes with however you proceed. It is truly lovely. I like how it turned out,it is different idea that worked out beautifully! I like how it looks…I really like those colors!! Hope the carpal gets better…I know what that is like!!! Nice and it could be worn with just about anything.